Ivory has been used in everything from jewelry and early tools to musical instruments such as the piano. The African Elephant has been a tragic source for this material, hunted to near extinction in recent centuries by mankind solely because of its ivory tusks. 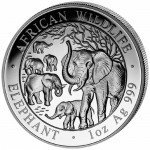 The African Wildlife Series celebrates these massive creatures by including them on the Silver Somalian Elephant Coins from the Bavarian State Mint. 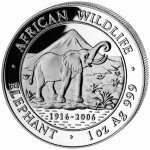 Today, you can purchase a 2010 1 oz Silver Somalian Elephant Coin from Silver.com in brilliant, uncirculated condition. 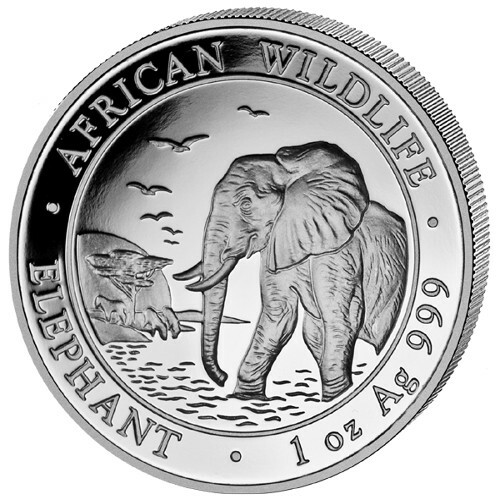 The Silver Somalian Elephant is one of many coins struck as part of the African Wildlife Series. Other coins include the Rwandan Buffalo and Impala Coins. 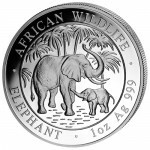 The first Silver Somalian Elephants were struck in 2004, and every year since has featured a brand new design on the reverse side of the coins. On the reverse side of the 2010 1 oz Silver Somalian Elephant is the image of a lone, male bull elephant crossing a river. In the background, several other creatures (presumably elephants) are visible emerging from the waters of the river, as the sun sets over the distant horizon. The elephant in the foreground is captured in amazing detail, with the Mint including lines in the folds of its tough hide. 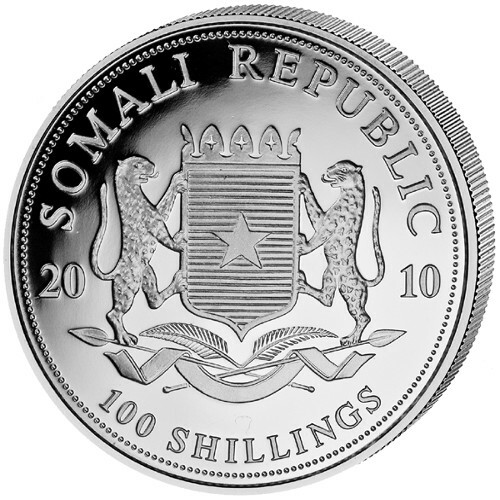 The obverse side of each Silver Somalian Elephant coin uses the same image each year. Two leopards stand on crossed spears, supporting the heraldic shield for the Republic of Somalia. In the middle of the shield, a lone star is set against a backdrop of horizontal lines. 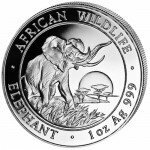 If you have questions about the Silver Somalian Elephant Coins, please feel free to contact a Silver.com associate. Our staff is standing by on the phone at 888-989-7223, online using our live web chat, and anytime via email.